It wasn't supposed to happen this way: Motorola had picked the date for its Fort Worth, Texas facility's dedication ceremony first. But then Apple went ahead to claim the date and stole the day's spotlight with its new iPhone reveals. No matter, as the gathering of press, factory workers and bold-faced names -- Google Chairman Eric Schmidt and Texas Gov. Rick Perry -- seemed minorly preoccupied with the major news of the day. We were in the midst of Nokia's old manufacturing plant, after all, now the birthplace of all custom-made Moto X's and there was the spirit of American manufacturing to celebrate. To drive that point home, some very Springsteen-ish tunes were pumped over the loudspeakers as we all patiently awaited the end of Cupertino's product showcase and the start of Motorola's "we can too make it in the USA" toldja moment. I even half-expected Miley Cyrus to jump onstage with an assortment of teddy bears brandishing raver-hued Moto X's. She didn't and an Americana Twitter-trending hashtag moment was missed. Still there was one exceptional and unscripted highlight waiting in the wings. It wasn't CEO Dennis Woodside nose-thumbing at those unnamed rivals that said US-based production could and would never happen. Nor was it Schmidt's patriotic pledge to the Texas facility: "This is a bet we're taking on America ... on Texas [and] on this incredible workforce that's assembled here. We think this is a very, very safe bet." No. It was the moment Woodside presented Gov. Perry with a Moto X -- designed with Texan colors -- and Perry, in response, unceremoniously spiked his iPhone to the floor below. Yes, the moment is caught on tape. 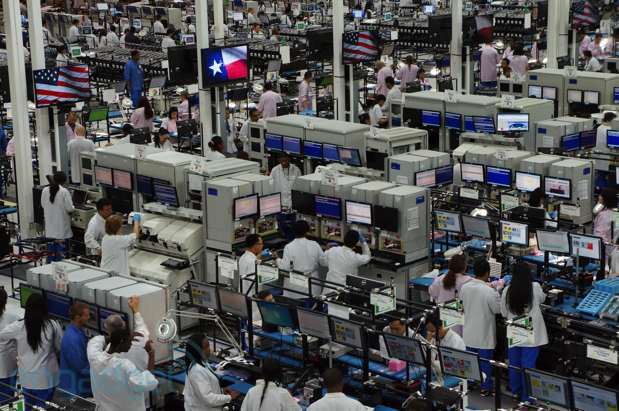 Just like an American dream, Motorola's Fort Worth facility went from zero to success story almost overnight -- give or take five months. And to hear the company tell it, it was nothing short of a miracle. 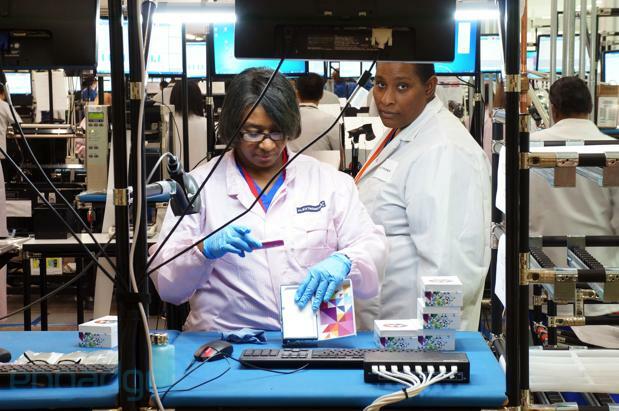 As Mark Randall, Motorola's SVP of Supply Chain and Operations explained, "Many of my peers in supply chain management, when I told them we're going to put a factory in the US ... they're like, 'You guys are crazy. There's no way. No one else has done it.' We took it to Google and they were like, 'Great. That's a good idea. Go for it.'" 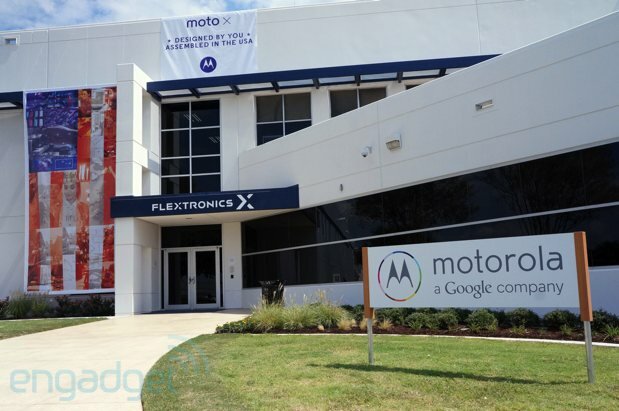 In less than half a year's time, the 455,000-square-foot facility transformed from a vacant, anonymous building in the Alliance region of Fort Worth into a busy center of production that employs about 2,500 people and ships nearly 100,000 Moto X's per week. The atmosphere on the production floor is calm; the noise of smocked workers is nearly non-existent; and their collective demeanor, by a superficial account, is one of placidity -- though this was a show day. Hope swells here; hope, manufactured by Motorola, that this is the beginning of a return to US-based production. And, just to ensure the sentiment isn't lost on those present, there are American and Texan flags beaming from monitors overhead the assembly banks. "This is a bet we're taking on America ... on Texas [and] on this incredible workforce that's assembled here. We think this is a very, very safe bet." But why Texas? According to Perry's remarks, it's because the state is a breeding ground for innovation by way of business-friendly tax breaks. A point Woodside seemed to reinforce when he said, "It does cost a little bit more to make the product here. But not so much more that it changes the overall economics. And we think over time we'll recoup that investment because we'll be able to improve the productivity of the plant much faster and also improve our designs much faster." And that's partly true, but there's a more sensible reason: it's the facility's geographic location, an area that also houses Amazon's and FedEx's gargantuan facilities, and serves as a well-connected transportation hub. "If you look at this area, the Alliance Federal area, it's logistically a really good location, " Randall said. "You have Alliance airport; you have Dallas-Fort Worth airport ... you have I-35, which goes up and down through the country. Even AT&T, for example, are in this business park. So when I ship a Moto X to AT&T, it takes two minutes to get the delivery of the product from my system to the AT&T system." 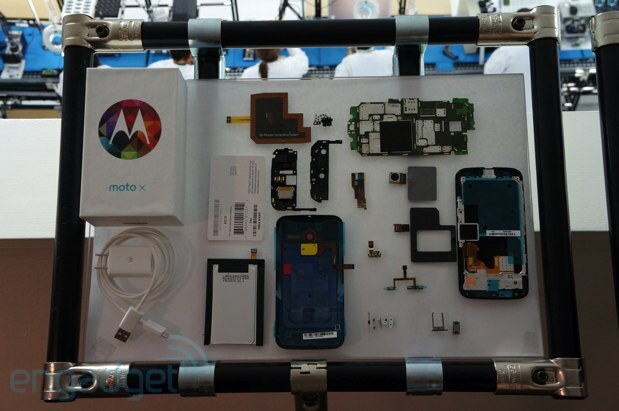 When the Moto X was first announced, Motorola pledged order fulfillment would take a maximum of four days. Yet, the facility is managing to ship those orders within three days, on average, and Randall has his sights set on lowering that number to just two days. It seems an impossible task: rushing out custom-built smartphones in such a short span of time. Especially when you factor in the future Verizon and Sprint Moto Maker orders that should begin to flood in just before the holidays -- when the service is set to expand beyond its AT&T confines. Yet, Randall believes that it can be done. "It's about system optimization; it's about dialing in our IT systems; it's about ... localization of some of the suppliers. The side keys can be configured; the [camera] ring ... if I can localize some of those variable components, I can continue to take down the order-fulfillment lead time." And with nearly 1 million unique visitors heading to Motorola's site just to play around with the various Moto X configurations, that potential reduction in wait time, if it does come to pass, could help on-the-fence consumers commit to a purchase. "In the future, people are going to want to configure with apps; they're going to want to configure with software, memory size -- maybe in the future even screen size ... [and] even processor speed." Wood-backed Moto X options may still be far off, but personalized inscriptions -- initially promised at launch and then suddenly yanked from the Moto Maker site -- should once again be available in about 30 days. That's the time frame Randall gave for the feature's reintroduction, but its return is unexciting in comparison to what could possibly be next. "We'll try and bring as much choice as possible. This isn't kind of a one-story wonder ... We think, in the future, people are going to want to configure with apps; they're going to want to configure with software; memory size -- maybe in the future even screen size ... [and] even processor speed." A fully customizable smartphone? That sure seems to be Motorola's way forward. What's more, Randall explained that consumers may even, one day, be able to upload schematics for 3D-printed accessories directly to the Moto Maker site. The Moto Maker message is out there, but it hasn't quite hit the saturation point Motorola would like and Woodside is aware of that. That's why overseas regions have yet to be given access to the Moto Maker site. "We want to get the product out and stable in the US and learn from what the consumers are telling us about the products," he said. So just what is it that Motorola's learning from US consumers? For starters, navy blue has turned out to be the most popular Moto X color and, more surprisingly, nearly "15 percent of people ... are choosing black with an orange accent." The takeaway from all this is that the site's current color options could change in step with consumer habits, but bear in mind this data only represents the AT&T consumer. With Verizon and Sprint Moto Maker orders set to arrive by year-end, these trends could easily shift. "We think [customization] is a pretty important part of what we want to do going forward. We think it's a consumer desire that is universal." Woodside said that the Moto X's unique software load, too, would soon change. In particular, work is underway to expand the breadth of Active Notifications to include third-party apps and deeper integration with Google's own application suite. He cited starring emails in Gmail, dismissing notifications and even reading sports scores as examples of what's to come. And none of this requires adoption of a new handset either, or a major Android version bump. "The good thing is we can do a lot of that without completely refreshing your software. We can do some of that over the air." As to when you can expect these expanded features, Woodside wouldn't say. He also remained tight-lipped about the future of Motorola's portfolio -- products like that previously announced lower-end smartphone -- saying only that, "We see a set of products that are taking some of the design cues, as well as technologies, from the Moto X and extending them into other form factors." Form factors like a 7- or 10-inch tablet? Actually, yes, the company is working on a new tablet, but Woodside declined to comment further. Motorola, as a brand, doesn't resonate much with consumers right now -- indeed, its rebirth was a little over a month ago. But this new Google company's sure of one thing: its unambiguous identity as a bastion for customization. It's that desire for personalization that Woodside believes is the future of the mobile device industry and he's all too eager for Motorola to lead the charge with an assembled in the USA backdrop. "I think people are happy to have a choice of a product that's built in the US ... We think [customization] is a pretty important part of what we want to do going forward. We think it's a consumer desire that is universal."